Registry Commander is a free software for Windows that administrators may use instead of the built-in Registry Editor. Most Windows users use the built-in Registry Editor when they need to change settings in the Registry or run Registry scripts to make the changes from the desktop without opening an editor at all. The Windows Registry Editor does have a few shortcomings that only become obvious on second glance. Users who just use it to change a single key that they know the path of won't experience most of them; administrators and tech savvy users on the other hand might. The built-in search, for instance, is not really that usable as it offers barely any search options. It lacks for example options to find only specific data types or sizes, or an efficient view that lists all search results right away. Microsoft did improve the Registry Editor in recent Windows 10 versions. It features an address bar now to quickly jump to paths and Windows 10 version 1809 will feature additional improvements such as dropdown suggestions as you type. Registry Commander is an advanced Windows Registry editor that uses a completely different layout than the default Windows Registry Editor. That's a problem as it means that users need to get used to the new layout first before they can make full use of the editor. The benefits that the application offers may be well worth that initial "getting-used-to" time. The biggest difference when compared to the default Windows Registry editor is the folder view of Registry Commander. It displays the Registry hive at the top, the keys in a Windows Explorer like view underneath, and user bookmarks in a third pane at the bottom of the program window. 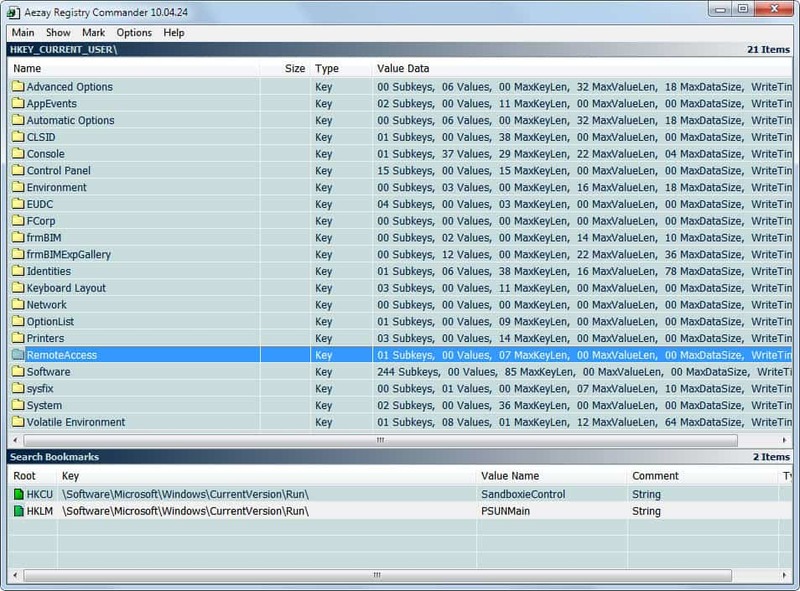 Each key is listed with its name and data; data includes the number of subkeys and values contained within. A double-click displays the new path, and its keys and values in the interface. It is possible to change the hive with a right-click on the path at the top. The application can connect to remote Registry hives as well; useful if you need to manage the Registry on network connected devices. Search is one of the strengths of the portable application. The search interface offers additional options that the default editor does not support. 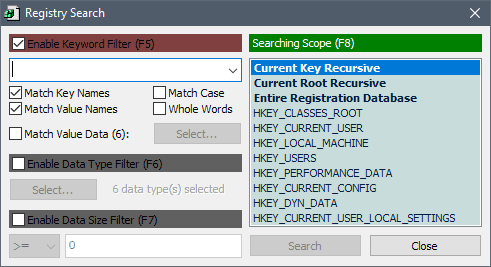 You can configure search to run across all keys or only specific keys, enable data type and data size filters, and select what you want search to find (e.g. key names and value names). Search results are displayed in the bookmarks pane. You find all matches listed there so that you can jump to a specific result right away without having to go through the whole list of keys and names found. Another interesting feature is the ability to set bookmarks which can then be accessed directly whenever the program is opened. Handy for users who often work with the same set of Registry keys. Registry Commander supports additional features that you may find useful. You can use it to copy, rename or move entire keys and values from one key to another, use cut and paste operations to move one key around, and it supports all 12 data types supported by the Registry and not just some of them. Registry Commander is a handy portable software designed for users who need more control over the Windows Registry. The software is available for download at the developer website. It is compatible with 32-bit and 64-bit editions of the Microsoft Windows operating system. Hoi Martin, Some time ago you asked your readers what we thought what would be improvements for your ghacks website. I filled in than a few suggestions but i forgot one really big improvement (for me) namely the opportunity, to blow up pictures (like the big one on this page) to one page new browser screen/ new tab screen. Like you do already with your Microsoft update page pictures every month (again thanks for that). This would be a really ferry great step forwards hopefully you will grand your readers, this big improvement. Ok no problem, I will try to do that from now on. Great Martin, This is ferry good news indeed and like I wrought to you here before, this will be ferry much appreciated probably not only be me. I’ve noticed in your posts the use of the English word “ferry”. In English, a ferry is a type of boat. If I use the English word “very” to substitute for your “ferry”, your sentences make more sense to me. Are you deliberately making some kind of play on words, or do you just need a friendly nudge to update your English spelling? Re: Registry Commander, Advanced Windows Registry Editor. Nice app! Would be great if you could enable the search results in the lower pane to be copied all in one shot to clipboard to paste into the exclusion field of some popular registry cleaners. As it is that with some programs a registry cleaner like the one in WinUtilities will always wipe out their functionality making it necessary to reinstall them unless all of their keys have been added to the exclusion list. Then too, with those same programs each time there’s an update the new keys must be added to the exclusion list and doing it one at a time is a real chore. Another approach was to simply export the root and hope that all of the keys and sub keys therein …all of the folders and such in them would be exported too. But this worked on some machines and not on others even though they all ran the same programs in the same OS on comparable hardware. The results were unpredictable. If one or none are those are missing in the program, these are MUST-HAVE FEATURE REQUESTS (that unfortunately many free registry editors that work on Win7 do not have).